Speaking on Thursday, President Donald Trump declared the opioid crisis to be a national emergency, and said that the government will be taking new steps to stem the crisis, including research into new types of painkillers, raising awareness of the issue, removing a certain painkiller from the market, and by encouraging people to not start taking drugs at all. Trump began by stating how the opioid epidemic has now become more deadlier than car accidents and gun violence in this country. He touched on the treatment facility in West Virginia that First Lady Melania Trump visited earlier this month, saying that one out of five babies born in that state has been exposed to drugs before they were born. He then spoke about his late brother, Fred Jr., who passed away after a struggle with alcoholism. Trump said that due to his brother's warnings, he has never had a drink of alcohol nor has he smoked a cigarette, and he thinks that the best way to stem the crisis is to make it so that people never take these drugs to begin with. In order to do this, Trump said that the border wall will be constructed, as 90 percent of heroin in the country comes from south of the border. Additionally, the NIH will begin research on a non-addictive painkiller and into new techniques for treating opioid addiction. 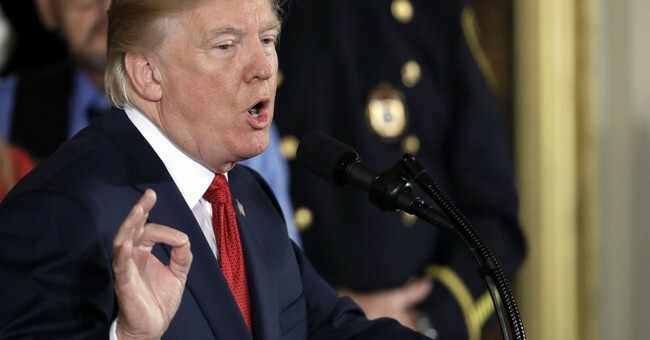 On the issue of fentanyl, a deadly synthetic opiate that comes mostly from China, Trump said that he will speak about the issue with Chinese President Xi, and will embolden the post office to inspect packages to look for the drug. Gov. Chris Christie, who chaired a commission regarding the opioid crisis in the United States, said that today was a "proud and important day" for people affected by the issue.